What is the Cal-JAC Academy? The Cal-JAC Academy is designed to provide an opportunity to qualifying candidates to earn their Emergency Medical Technician (EMT) certification as the first step toward a career in the fire service. 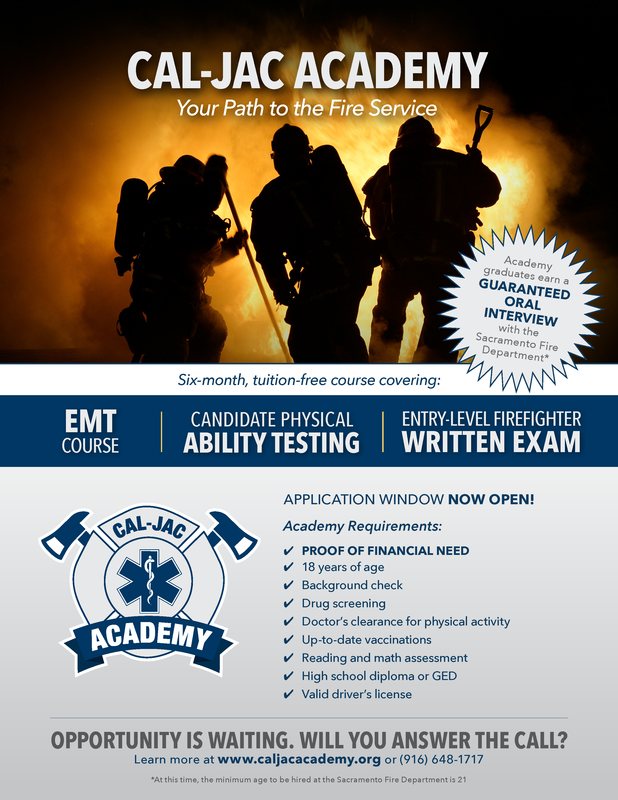 In addition to obtaining the skills required of a nationally registered EMT, academy cadets will physically train for the Candidate Physical Ability Test (CPAT), receive preparatory instruction for the Cal-JAC written exam, and hone their interview skills through the guidance of a firefighter mentor. All graduating cadets will also be invited to interview for a position with the Sacramento Fire Department and be added to FCTC’s Statewide Eligibility List, which is used by fire departments throughout California that are looking to hire.